The visit not only marks 25 years of diplomatic relations between the two countries but also a marked shift in New Delhi approach towards a country that has emerged as its major arms supplier. PM Modi will travel to Israel on a three-day visit from July 4. NEW DELHI: Prime Minister Narendra Modi will script history next week when he travels to Israel on a three-day visit beginning July 4, the first Indian PM to step on Israeli soil, the foreign ministry announced on Wednesday. The visit not only marks 25 years of diplomatic relations between the two countries but also a definite shift in New Delhi's approach towards a country that has been its major arms supplier. India is the largest buyer of Israeli military equipment, while Israel is India's largest customer after Russia. The groundwork for the visit, which will see some big ticket defence deals, has been on for months. Among the pacts being finalised is a plan for Spike anti-tank missiles for the Indian army and Barak-8 air defence missiles for the navy valued at $ 1.5 billion. Recently, the Israel Aerospace Industries had announced a $ 2 billion mega missile pact that will give Indian forces an advanced defence system of medium-range surface-to-air missiles. This deal has been called Israel's biggest defence contract. To Israel, the visit holds much more significance than just one about selling its military hardware. 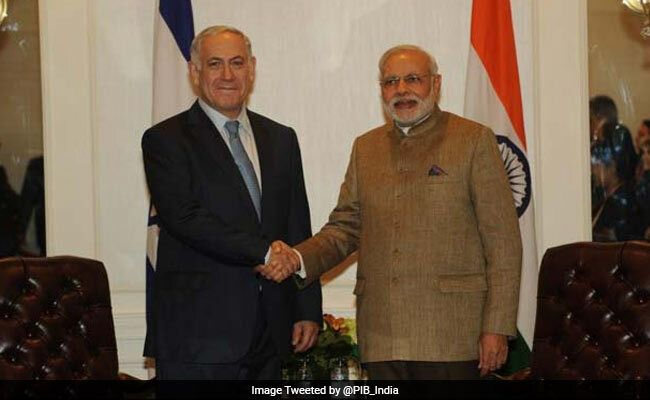 Well before New Delhi announced the visit, Israeli Prime Minister Benjamin Netanyahu outed news of "my friend" PM Modi's "historic visit" travel in a series of tweets. PM Netanyahu: Next week, the Indian Prime Minister, my friend, @NarendraModi will arrive in Israel, This is an historic visit to Israel. The two countries had established full diplomatic relations only in 1992. PM Modi and Mr Netanyahu did meet on the margins of the United Nations General Assembly in New York in September 2014. It was then, the first meeting of the Prime Ministers of the two countries in over a decade. "In the 70 years of the country's existence no Indian Prime Minister has ever visited and this is further expression of Israel's strength," Mr Netanyahu's said before chairing a cabinet meeting on Monday that cleared multiple pacts to be signed with India next week. "This is a very significant step in strengthening relations between the two countries. Ties between Israel & India are on a constant upswing," Mr Netanyahu's office tweeted. These decisions "will deepen these ties, beginning with expanding exports and cooperation in agriculture and water". The two countries will also establish a joint fund for innovation and R&D, or research and development. On July 5, PM Modi will also address Indians in Israel who have launched a website for his trip. About 80,000 Indian Jews belonging to four different communities - Bene Israel, Cochinis, Baghdadis and Bnei Menashe - live in Israel. PM Modi, who had travelled to Israel in 2006 when he was the Gujarat Chief Minister, was widely expected to make the visit much earlier. Instead, President Pranab Mukherjee travelled to Israel in 2015 and addressed Israeli parliament too. It was during this visit that Mr Netanyahu had spoken about his earlier interactions with PM Modi. External Affairs Minister Sushma Swaraj followed it up with a visit in 2016.